* On good days, I get a spicy floral mix which dries down to an earthy amber. * On bad days, it’s an evil caustic vetiver that borders on chemical waste. It then fades into a dirty, musky patchouli with a bit of skunk (in a bad way). Summary: So, I’ve worn this nearly 20 times while testing it in the hope of trying to discern what triggers the different scent journeys. I simply can’t predict which way it will go when I wear it. When it’s good, it’s really amazing. When it’s bad, it puts me in such a bad mood that I feel like torturing unicorns. 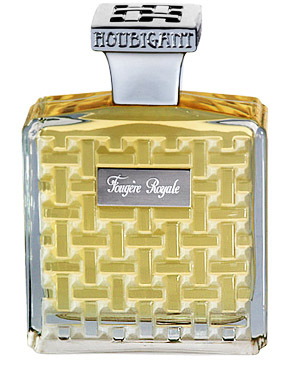 This is an update of a classic fougere that pretty much defined the category. I’ve never smelled the original, so I can’t compare. All I know is that you should test this several times before you consider buying it. Longevity is good at more than 10 hours either way it goes (either a blessing or a curse). Although a little strong at first, it is office-friendly. Houbigant fragrances are available through Lucky Scent and Neiman Marcus. Disclaimer: Bottle given to me as a gift from a friend – no disclaimer needed. Image courtesy of Lucky Scent.